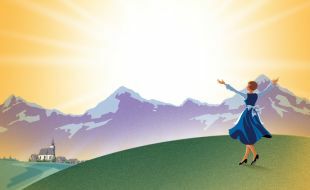 This lavish production, presented in South Africa by Pieter Toerien, David Ian and The Really Useful Group, tells the story of the Von Trapp family’s flight across the mountains from Austria, with its unforgettable score that includes some of the most memorable songs ever performed on the musical stage including “My Favourite Things”, “Edelweiss”, “Do-Re-Mi”, “Sixteen Going on Seventeen”, “The Lonely Goatherd”, “Climb Ev’ry Mountain”, and the title song “The Sound of Music”. Featuring an all-star South African cast back from their international tour, The Sound of Music is a must-see on the 2018 theatrical calendar! Book to see The Sound of Music and your ticket becomes your passport to great experiences at our beautiful, stylish Montecasino hotels and award-winning hotel restaurants. Enjoy a delicious meal before the show, at either Aarya, Punchinello’s or Medeo restaurants. Present your untorn show ticket at the restaurant and get 25% off each ticket holder’s meal and drinks. Stay with us after the show and get between 10% and 50% off the Best Available Rate at either SunSquare Montecasino, Southern Sun Montecasino or Palazzo. To pre-book your accommodation, please email your reservation request (including a scanned show ticket/s) to Montecasino.reservations@tsogosun.com or call the Montecasino Reservations Centre on +27 11 367 4250. Discounted dining and hotel rates are valid for the period 31 March to 29 April 2018 and must be taken up over the same period. Each valid show ticket can be used for both the dining and accommodation offers, and are subject to availability. Discounts do not apply to accommodation that has already been booked and paid for. The dining discounts are only available at Aarya, Punchinello’s and Medeo restaurants. Each diner will need to present a valid untorn show ticket, no discount will be applicable for full payment One discount applies when the bill is settled, provided that all diners have valid show tickets. Where there is no valid show ticket, the full amount is payable for dinner. Discounts are valid for Tuesdays, Wednesdays, Thursdays, Fridays and Saturdays only. Family rooms are not available at SunSquare Montecasino, therefore the kids policy of staying and eating breakfast for free when staying with 2 adults does not apply to this hotel. Rates include Value Added Tax but exclude a 1% Tourism Levy charge per room, per night.